Birmingham bin workers are expected to resume strike action after the city's council said it was issuing redundancy notices. 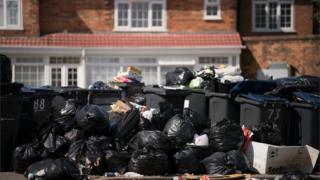 The seven-week strike action that saw mountains of waste pile up on streets was suspended on 16 August amid talks between Unite and the city council. But the council reneged on a deal that saw the strike suspended and said a meeting due on Friday would not happen. The Unite union described the move as a "deeply provocative act". It said refuse workers were expected to resume industrial action and could walk out for three hours on a daily basis at 07:00, 10:30 and 13:00 BST. The union warned industrial action "could extend until the new year". Conciliation service Acas said on 16 August the council had accepted the workers' case and restored the jobs of grade three workers, who are responsible for safety at the back of refuse vehicles. But a council report said the deal struck by Unite and the council was unaffordable. The authority said on Thursday it was issuing redundancy notices to certain grade three workers "in order to protect its legal and financial position". But alternative jobs at the same grade and salary elsewhere were available for those employees, it said. Unite assistant general secretary Howard Beckett said: "This is a deeply provocative act that drives a coach and horses through the agreement Unite reached with the council in good faith at the conciliation service Acas. "It does a great disservice to the people of Birmingham and the city's refuse workers who now face being made redundant and losing their livelihoods or pay cuts of thousands of pounds." The union urged the council to "come to its senses" and withdraw the redundancy notices to avoid disruption to services. The council said it wished to continue ongoing discussions "with trades unions through Acas in parallel with seeking alternative jobs for the Grade 3s affected by redundancy". Lisa Trickett, cabinet member for clean streets, recycling and environment, added: "We hope that, in view of the ongoing discussions with Acas, Unite will not take their workforce back out on strike but continue in discussions with us and the other unions."